The Associated Press NFL Offensive Player of the Year Award is given annually by the Associated Press (AP) to the offensive player in the National Football League (NFL) deemed to have had the most outstanding season. The winner is chosen by votes from a nationwide panel of sportswriters who regularly follow the NFL. Multiple-time awardees include Marshall Faulk and Earl Campbell, both of whom won the award three times, each consecutively. Jerry Rice, Barry Sanders, Tom Brady, Terrell Davis, Drew Brees, and Peyton Manning have each won the award twice. The award is currently held by quarterback Patrick Mahomes of the Kansas City Chiefs, who received it for the 2018 NFL season after leading the league with 5,381 passing yards and 50 touchdowns. Every winner of the award has been either a running back or a quarterback, with the exception of Rice, who won twice as a wide receiver. Running backs have been awarded 26 times, followed by quarterbacks, with 20 awards. Of the 47 winners, 28 were also named the AP NFL Most Valuable Player in the same season. Since 2011, both awards have been given out at the annual NFL Honors ceremony along with other AP awards, including the AP NFL Defensive Player of the Year Award and AP NFL Offensive and Defensive Rookie of the Year Awards. Players are often awarded after record-breaking or near-record-breaking offensive seasons. Running back O. J. Simpson won the award for 1973 after rushing for a record 2,003 yards, becoming the first NFL player to rush for 2,000 yards in a season. When his record was broken by Eric Dickerson in 1984, Dickerson placed second in voting behind quarterback Dan Marino, who that year was the first to pass for 5,000 yards in a season. Marino's 5,084 yards stood as the record for 27 years before being broken by Drew Brees in 2011, who won that season's award. In turn, 2013 winner Peyton Manning set league single-season records for passing yards (5,477) and passing touchdowns (55). 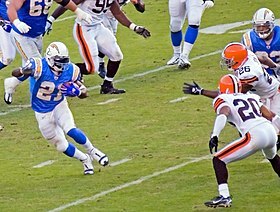 2006 winner LaDainian Tomlinson set NFL single-season records for rushing touchdowns (28), touchdowns from scrimmage (31), and points scored (186). 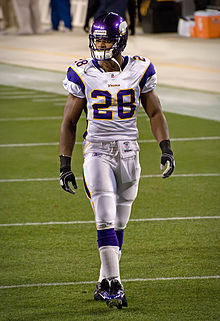 Adrian Peterson won the award in 2012 after rushing for 2,097 yards, the second most all time by a player in a single season. Gellerman, Jacob; Drexler, Sam; Marini, Matt; Cocchiaro, Nicolas; Zerkel, Alex, eds. (2016). 2018 Official NFL Record and Fact Book (PDF). National Football League. p. 524. Retrieved August 14, 2018. "AP Offensive Player of the Year Winners". Pro-Football-Reference.com. Sports Reference LLC. Retrieved July 5, 2016. ^ a b Gordon, Grant (2019-02-02). "Patrick Mahomes named NFL Offensive Player of Year". NFL.com. ^ Hope, Dan (July 7, 2013). "Ranking the Top 25 NFL Offensive Player of the Year Candidates". Bleacher Report. Retrieved May 26, 2017. The award is typically given to the league's most productive quarterback or running back. Of the 41 times it has been given, it's been won 39 times by either a quarterback or running back. The exception is San Francisco 49ers wide receiver Jerry Rice, who won the award in both 1987 and 1993 . ^ "First-ever 'NFL Honors' show will be hosted by Baldwin in Indy". NFL.com. National Football League. January 3, 2012. Retrieved July 10, 2016. ^ a b "Simpson Offensive Winner". Kentucky New Era. Associated Press. January 4, 1974. p. 11. Retrieved July 5, 2016. ^ a b "Record-breaking Marino wins top offensive honor". Gadsden Times. Associated Press. December 19, 1984. p. D2. Retrieved July 6, 2016. ^ a b "Saints' Brees wins AP Offensive Player of the Year award". NFL.com. NFL. February 4, 2012. Retrieved July 5, 2016. ^ a b "Broncos' Peyton Manning earns Offensive Player of the Year". NFL.com. NFL. February 2, 2014. Retrieved July 5, 2016. ^ a b Wilner, Barry (January 5, 2007). "L.T. Wins AP Offensive Player Award". The Washington Post. Associated Press. Retrieved February 2, 2017. ^ a b "Adrian Peterson tabbed AP Offensive Player of the Year". NFL.com. NFL. February 2, 2013. Retrieved July 5, 2016. ^ "Top NFL Offensive Player: Larry Brown Doesn't Like Comparisons With Others". Observer-Reporter. Associated Press. January 5, 1973. p. B-4. Retrieved July 5, 2016. ^ "Ken Stabler Named NFL's Offensive Player Of Year". Sarasota Herald Tribune. Associated Press. January 8, 1975. p. 1C. Retrieved July 5, 2016. ^ "Tarkenton Honored". The Victoria Advocate. Associated Press. January 13, 1976. p. 2B. Retrieved July 5, 2016. ^ "Offensive Award to Bert Jones". The Victoria Advocate. Associated Press. December 30, 1976. p. 1B. Retrieved July 5, 2016. ^ "Chicago's Payton Picked Offensive Player Of Year". Herald-Journal. Associated Press. January 5, 1978. p. C3. Retrieved July 5, 2016. ^ "Campbell Wins Offensive Title". Daytona Beach Morning Journal. Associated Press. January 12, 1979. p. 6B. Retrieved July 5, 2016. ^ "Campbell Walks With Second Offensive Title". The Virgin Islands Daily News. Associated Press. December 24, 1979. p. 33. Retrieved July 5, 2016. ^ Olderman, Murray (January 18, 1981). "Earl Campbell: a triple champ". The Nevada Daily Mail. Newspaper Enterprise Association. p. 10. Retrieved July 5, 2016. ^ "Anderson is top offensive player". The Telegraph. Associated Press. January 8, 1982. p. 18. Retrieved July 6, 2016. ^ "Fouts Tops On Offense". Toledo Blade. Associated Press. January 7, 1983. p. 18. Retrieved July 6, 2016. ^ Lowitt, Bruce (December 23, 1983). "Theismann crowned as top offensive player". Daily News. Associated Press. p. 3B. Retrieved July 6, 2016. ^ Nadel, John (December 30, 1983). "Allen sweeps offensive honors". The Free Lance-Star. Associated Press. p. 5. Retrieved July 6, 2016. ^ "Dickerson earns offensive honor". The Free Lance-Star. Associated Press. December 30, 1986. p. 10. Retrieved July 6, 2016. ^ Wilner, Barry (December 29, 1988). "Craig earns offensive award". The Times-News. Associated Press. p. 20. Retrieved July 6, 2016. ^ a b "Young named Offensive Player of the Year". The Times-News. Associated Press. January 5, 1993. p. 1B. Retrieved July 6, 2016. ^ "Moon top offensive player". Bangor Daily News. Associated Press. January 10, 1991. p. 11. Retrieved July 6, 2016. ^ Wilner, Barry (January 6, 1994). "Rice Offensive Player of the Year". Ocala Star-Banner. Associated Press. p. 1B. Retrieved July 6, 2016. ^ "Sanders are players of the year". The Tuscaloosa News. Associated Press. December 29, 1994. p. 3C. Retrieved July 6, 2016. ^ "Favre voted best on offense". The News. Associated Press. December 30, 1995. p. 3C. Retrieved July 6, 2016. ^ "Denver running back Davis is Offensive Player of the Year". The Argus-Press. Associated Press. December 27, 1996. p. 10. Retrieved July 6, 2016. ^ Barry, Wilner (December 26, 1997). "Detroit's Sanders named Offensive Player of Year". Daily News. Associated Press. p. 1B. Retrieved July 6, 2016. ^ Wilner, Barry (January 6, 1999). "Davis named Offensive Player of the Year". Boca Raton News. Associated Press. p. 4B. Retrieved July 6, 2016. ^ "Faulk is overwhelming choice for offensive player of the year". The Southeast Missourian. Associated Press. January 13, 2000. p. 1B. Retrieved July 6, 2016. ^ "Faulk: Offensive Player of Year". Gadsden Times. January 5, 2001. p. D3. Retrieved July 6, 2016. ^ "Marshall Faulk wins Offensive Player of the Year". The Argus-Press. Associated Press. January 18, 2002. p. 11. Retrieved July 6, 2016. ^ Wilner, Barry (January 10, 2003). "Honored Holmes: Chiefs back voted top offensive player". The Victoria Advocate. Associated Press. p. 5B. Retrieved July 5, 2016. ^ "Ravens' Lewis named AP's offensive player of the year". Athens Banner-Herald. Associated Press. January 1, 2004. Archived from the original on August 19, 2016. Retrieved July 5, 2016. ^ "Manning claims offensive award". TimesDaily. Associated Press. January 6, 2005. p. 3C. Retrieved July 5, 2016. ^ Wilner, Barry (January 5, 2006). "Alexander named NFL MVP, top offensive player". USA Today. Associated Press. Retrieved July 5, 2016. ^ "Brady adds AP Offensive Player of Year to MVP". NFL.com. Associated Press. January 8, 2008. Retrieved July 5, 2016. ^ "Brees named AP offensive player of year". ESPN.com. Associated Press. January 6, 2009. Retrieved July 5, 2016. ^ "Johnson makes fast impression". ESPN.com. Associated Press. January 13, 2010. Retrieved July 5, 2016. ^ "Brady wins AP offensive player of year award". The Denver Post. February 1, 2011. Retrieved July 5, 2016. ^ Brinson, Will (January 31, 2015). "NFL Offensive Player of the Year: DeMarco Murray beats Aaron Rodgers". CBS Sports. Retrieved July 5, 2016. ^ "Cam Newton named NFL MVP and offensive player of the year". The Guardian. Associated Press. February 6, 2016. Retrieved July 5, 2016. ^ McClure, Vaughn (February 4, 2017). "Falcons QB Matt Ryan wins NFL MVP, Offensive Player of Year". ABC News. Retrieved April 23, 2017.